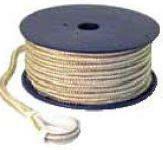 BoaterSports Quality Anchor Lines are a perfect match for your BoaterSports Anchor. These lines are constructed of high quality, marine grade material, UV stabilized for the harsh marine environments. BoaterSports anchor Lines are designed to maintain their flexibility, strength and abrasion resistant qualities, ensuring ease of handling whether the line is wet or dry. Top-of-the-line gold and white, double braid, nylon dock line is the strongest, most dependable line available. It does not twist or buckle under strain. It is also easy on the hands and does not harden. Professionally whipped and spliced nylon anchor thimble. Resistant to rot, mildew, abrasion, oil and grease. Low elongation. 100% nylon.